Diksha Dalal-Clayton, daughter of expatriate Indian parents, was born in Zambia, in the heart of Africa. She imbibed Hindu lore from devout elders of her large family. Of all the charming gods and goddesses of the Hindu pantheon the frolicksome Krishna captivated her imagination. She drank deep at the fountain of the Krishna legend, and wanted to share the Blue God's adventures with other children. 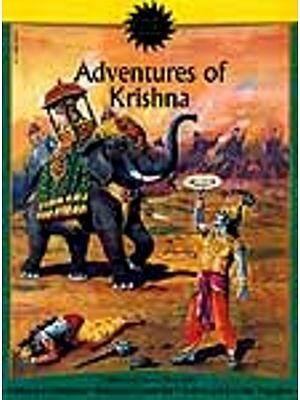 This book contains the stories of Krishna as re-told by Diksha in her inimitable style, for a new generation of readers. It is a posthumous publication, as she died of cancer in 1991 when she was just 34. Krishna has always been a favourite of children. Although he was a god, he was constantly in trouble as a boy. He was brave and good, but he could also be cheeky and naughty. He stole butter from his neighbours and teased the village girls, but he was also a loyal and kind friend, and wise beyond his years. As he grew up he would have to fight demons and monsters to rid Mathura of the evil regime. This fresh, new collection of Krishna's adventures begins with the dramatic story of his birth, and his escape as a baby from his cruel uncle. The stories vividly illustrate the eternal battle between good and evil, and their rhythm and charm ensure they will be loved and remembered. We were a large family with uncles, aunts, cousins and grandparents coming and going and sometimes all staying under one roof. All the children ate and played and fought together, and there were times when the noise was just too much for the adults. The only thing that was guaranteed to keep all the children quiet was the promise of stories. We had no television and few books, but there was usually a grandmother, an aunt or a mother who was willing to sit down and tell us stories. Of course, there was a price to be paid. I remember having very mixed feelings whenever I saw those huge sacks of rice and lentils and spices lined up against the back door, for I knew there would be no hopscotch, no marbles and no climbing trees that day. Instead, we girls would have to sit cross-legged on the veranda floor with large, round trays on our laps filled with whatever it was, picking out the sticks and stones, sifting and cleaning. This was our contribution to the daily round of cooking for and feeding so many people. It was a boring and fiddly job, which I hated, and the only thing that ever made it worthwhile for me was the prospect of stories. Stories about Ancient India, of magic and miracles, Ram and Sita, Radha and Krishna. It made no difference to me that I was sitting in the middle of Africa, as far as I could possibly be from that mythical, mystical land. For me it was a land of Maharajahs and Ranis, of monsters and Rakshasas, sadhus and saints. The quiet voices of my grandmother, my aunt or my mother told us the stories just as they had heard them when they were children. They painted vivid, Technicolor pictures in my mind, which are as sharp today as they were when I was little. I loved stories about Krishna. It was comforting to know that there was a god who knew what it was like to be constantly in trouble. If a god could steal butter and still be good, there was hope for me. The idea that his skin was blue fascinated me too: It was so much more interesting than my own drab brown, and the thought that Krishna could be such a strange colour and life and steal and still get away with it, was wonderful. Krishna's life was lived on a grand scale. Everything was larger than life, and our own day to day grumbles were petty compared to the calamities, which befell the people in the stories. Rage and jealousy and evil all played their part, but it was balanced by good, and reassuringly the good always won. It was through the stories we heard while chopping vegetables for the next meal, or sifting chapatti flour, or doing other tedious jobs that we began to understand the meaning of our Hindu festivals and customs. It was through following the lives of the people and the gods and goddesses in those stories that we came to understand the importance of duty and responsibility towards our family, and everything that we knew to be good. The stories gave us a framework around which to shape our lives. They showed us the difference between good and evil, and although we didn't know it at the time, the lessons we learnt seeped naturally and easily into our minds and stayed there. Of course we read stories in English at school, but the world they created in my mind was dull and foreign. The rhythm and the beauty and the magic were not there, and it was only when I learnt about the Greek and Roman gods and goddesses that I began to understand what I had been missing. The Greek and Roman myths captured the same feeling of mystery which I felt when I heard the stories about Krishna, Ram, and the other Indian gods and goddesses. The world is different now. Not many families live together as ours did when I was little, and children are lucky if they have someone on hand who will tell them the stories that they themselves heard when they were small. It would be a pity if we lost the magic of those ancient stories forever, never to be heard again. I hope that this collection of stories will colour the imaginations of those who have not had the chance to enjoy them before.